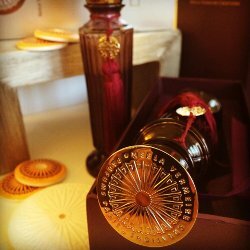 More limited edition collector fragrance bottles, with the usual disclaimers: in most of these cases, the juice is unchanged, just the bottle is “special” (or not, as the case may be), and some of these may not be available in the US. 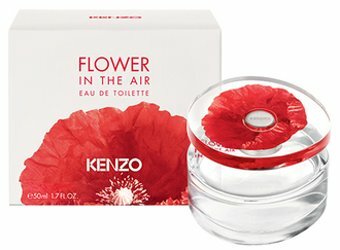 Today's post includes collector bottles from Miller Harris and Jean Paul Gaultier, new packaging from Annick Goutal (and a new concentration for Matin d'Orage), and new concentrations from Neela Vermeire Créations and Kenzo. 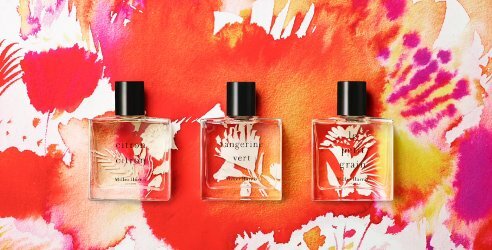 From Annick Goutal, a new Eau de Parfum concentration of Matin d'Orage: "Five years after the launch of Un Matin d'Orage Eau de Toilette, Camille Goutal and Isabelle Doyen are offering a more sensual variation, a rewriting of this first creation. A sensual white flower harboring notes of desire…A bouquet of magnolia, both delicate and diffuse. A touch of tuberose, milky and creamy, rolling over her skin. A vanilla background, deliciously intense, enriched with guaiac wood, slightly smoky, and myrrh with its woody undertones." Available in 50 and 100 ml at Annick Goutal. 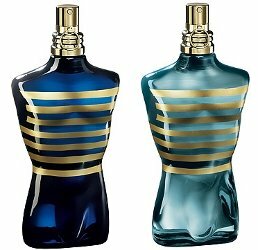 You might also notice that the milky-white bottle from the original Eau de Toilette version is now clear: this is the new packaging for the line, and all the bottles (with the exception of the collector editions) are now clear glass. So, a Matin d’Orage in EdP. I liked the original but it was so faint… hmm. Didn’t love it, though, probably not worth jumping on. But that pink-and-orange background behind the Miller Harrises!!! I so want that as a scarf. It’s a shame they did not do more with that watercolor…it’s on the outer boxes, but the bottles themselves are dull in comparison. I want to try the Pamplemousse, haven’t seen it in the US yet. Before I became a CRAZY perfumista-collector,my signature scent was Le Male.I have not worn it in like 5 years,but I do love the bottles still!And I want those 2! !Beautiful and perfect fit with the rest of my collection! about the MH bottles, that is. I really have never liked those JPG bottles..I find them tacky. If I wanted a bottle like that, it’s too much like the head of a Ken doll got popped off and the legs…and don’t like picking up a botte and touching a ‘package’ that sticks way out..just me though. I like the JPG bottles, although these renditions are not my absolute favorites. But totally agree they’re tacky!